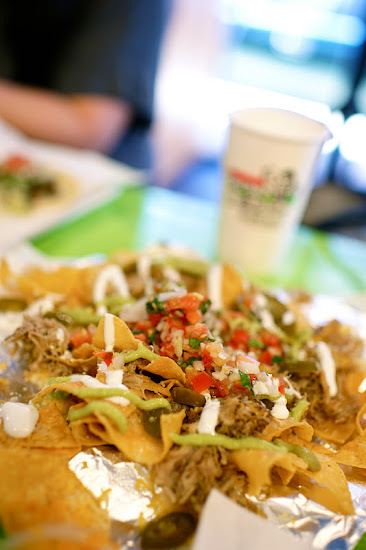 Macho Tacos opened a new branch of their popular Baja style Mexican eats in the Shida neighborhood late last month. 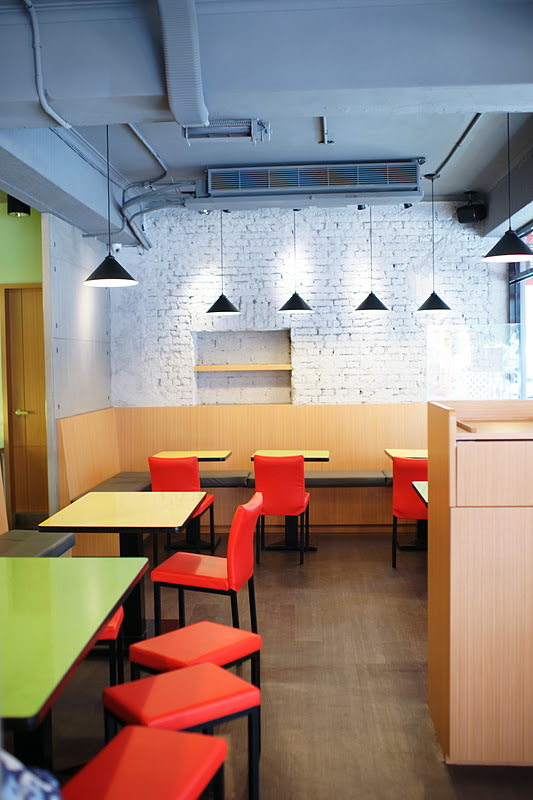 Almost twice the size of the original DaAn branch, there's more room for all your grub and friends. Ten percent off during their soft opening period. The inside sports the familiar wrestler logo, English and Chinese signage and red/green fast casual tables. 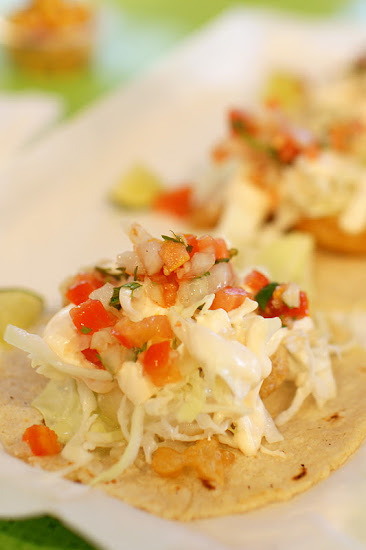 My favorites are still the fish tacos. Crispy fish, crunchy lettuce and creamy white sauce. You can't really appreciate how far Mexican food has come in Taiwan unless you try the fish tacos- they are the must order at Macho Tacos. 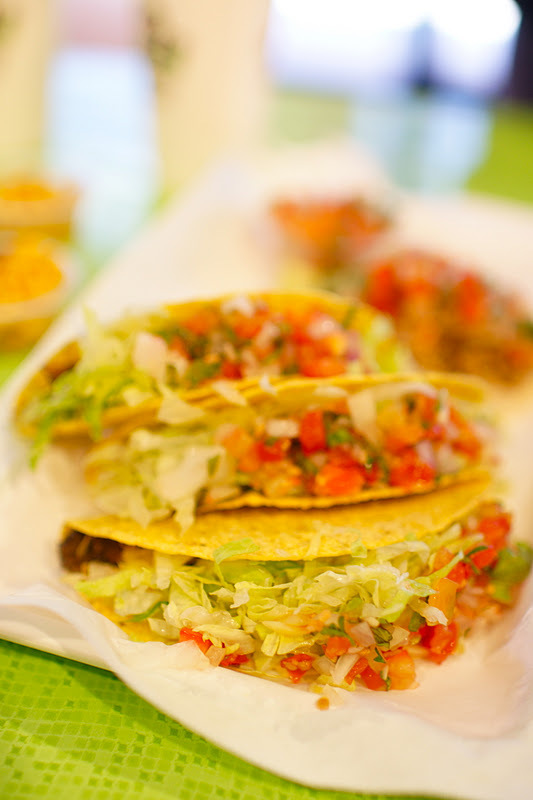 The next favorites after the fish tacos are either the steak or carnitas in soft taco, burrito, burrito bowl or quesadilla form. Don't forget to load up on the salsa at the help yourself salsa bar, and ask for the hot sauce. If I had one suggestion for the powers that be, Macho's nachos still need more cheese. A lot more cheese. Melty, piled on cheese. At other places, I've seen the chips bathing in cheese. That's how nachos should be. But until then, I'm pretty happy with most of what Macho Tacos offers and the affordable prices. Chimichangas are also available now. Maybe in the future we can hope for some taquitos smothered in guacamole? No. 3, Lane 126, Yanji St. I made meatballs for the first time this year (spurred on by cravings watching America's Next Great Restaurant) and was surprised to find out how freakin easy it is! Maximum flavor for a little elbow grease. And the meatballs can be eaten as a side dish, with spaghetti or for a meatball sub. Mix elements by hand, form little balls. 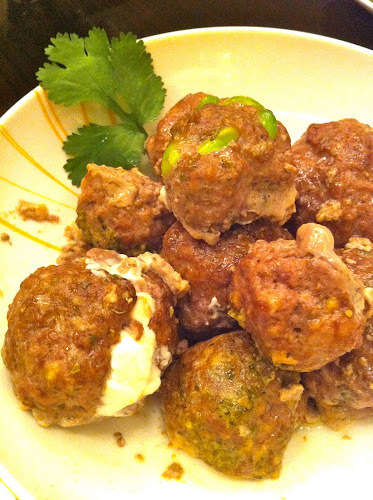 Can make original flavor and then some with add-in ingredients. 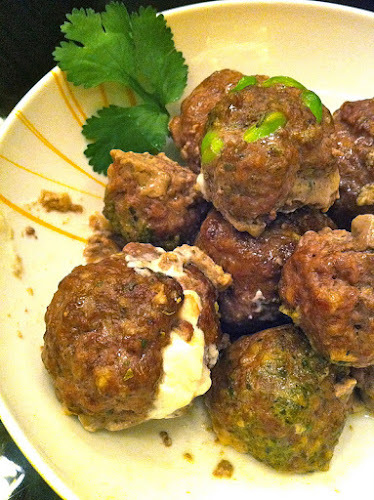 If stuffing with cheese, then cut cheese into cubes to form the meatball around the cheese. I made some with just pesto, some with pesto and edamame, and some with pesto and goat cheese. 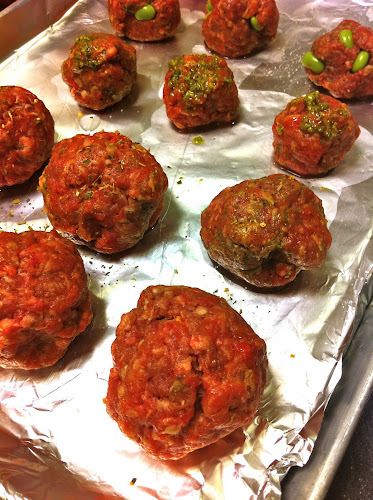 I like to make mini meatballs too, but if you make different size meatballs, it's best to put them on different trays since the mini ones will cook faster. Cook in oven for about 20-25 minutes at 180C (or 350F) or until browned and cooked through. 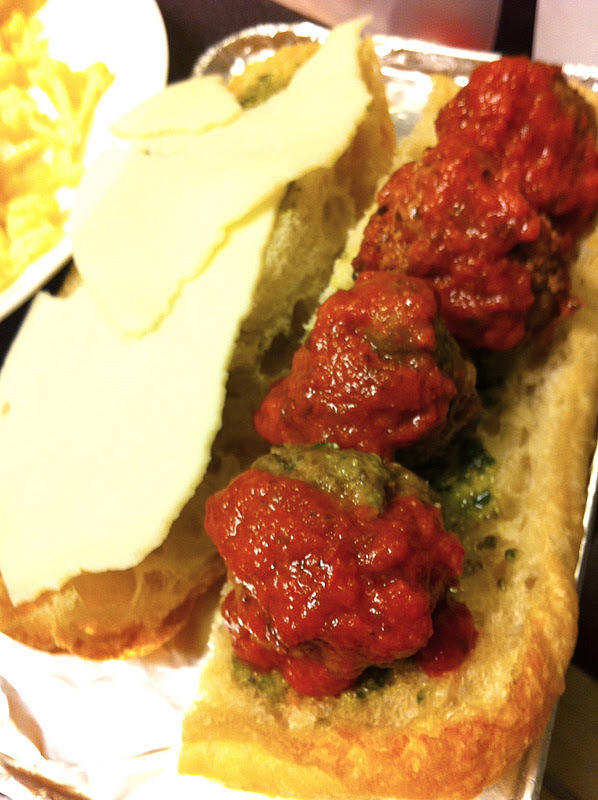 Use leftover meatballs the next day for meatball sub. SO GOOD. I just spooned some tomato pasta sauce onto the meatballs and brushed ciabatta roll with pesto sauce, added some provolone cheese (thanks to my friend M) and threw it in the toaster oven. Decadent and delicious. You cannot find a good meatball sandwich in Taipei, and no Subway doesn't count- for some reason Taipei's Subway meatballs are too processed. 4th Annual 2011 Best of Taipei Restaurants Readers' Favorites Poll! 2011 was a busy year and the end of the year somehow makes things even more insane. But it's that time of year again- time to reflect, time to stuff your face and time to vote for your favorites! Check out last year's results if you need a cheat sheet. Voting will be open from December 20th, 2011 - January 8th, 2012. There must be a minimum of 5 categories filled out (with different restaurants) in order for the vote to be counted. For example, you cannot fill out the same restaurant in 3 categories and nothing else. But if you really love that restaurant, vote for it in the applicable 3 categories and fill out 4 other categories, then it will count. It's okay if you haven't tried everywhere in Taipei! No one has. It does not have to be a restaurant I've reviewed. So just vote for your favorites! So hope all of you that have been reading and learning where the best eats in Taipei can take a few minutes to vote! You don't have to have a google account to vote. Just enter your name or initials and fill out the boxes underneath with your answer and hit submit at the end. Also feel free to campaign for your restaurant or favorite eatery on Facebook, Twitter or your website with a link to this page. But only votes on this post will count. I will tabulate and hope to announce the winners with a write up by February 2011 (fingers crossed!). Thank you and happy holidays and happy new year! Remember There must be a minimum of 5 categories filled out (with different restaurants) in order for the vote to be counted. For example, you cannot fill out the same restaurant in 3 categories and nothing else. Looking for a place to nosh with friends after watching Mission Impossible: Ghost Protocol (go watch it!) the other night and the Diner is booked for a private party. Where to do we end up? After wandering around ATT 4 Fun, we decide on Coffee Alley and get in after a 10 minute or so wait. I know what I want to order since I didn't get to try it the last time and the ice cream with cotton candy and espresso (NT$140) doesn't disappoint. You might miss it on their crowded menu, but now you know what to look for. Cotton candy has been popping up on more and more dessert menus since I first was given a bowlful at Simon in Las Vegas. From straightforward to the ultra creative (Bazaar's foie gras and cotton candy), Coffee Alley's rendition is playful yet smart. You pour the small pitcher of espresso on top of the cotton candy and watch it shrink before your eyes. It's like maaaaaaagic. As the spun sugar melts into a coffee caramel sauce, you finally get a peek at the ice cream. Three generous scoops of vanilla ice cream are coated with sticky sweet espresso sauce that works perfectly with the nuts and ice cream. Sometimes a huge cloud of cotton candy is too sweet to eat the entire thing, so I was worried this dessert would be too sweet, but somehow the espresso neutralized the sugar so it was just right. I'd duke it out with the Coffee Alley crowds just for this dessert. For addresses for Coffee Alley, check out my previous post. Kid friendliness: high chairs and kids dinnerware available. basement seating as well as main floor seating. 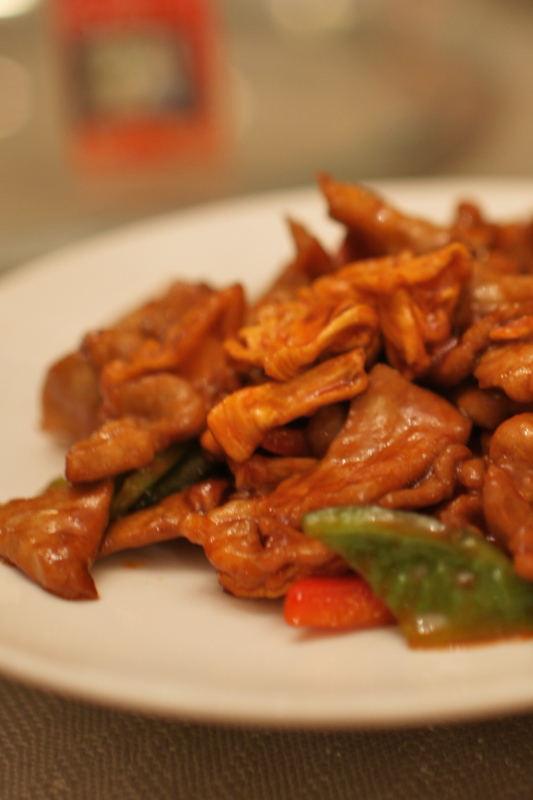 There are a few dishes you must order when you go to He Feng Chinese restaurant from the vast menu. (1) The Deep fried pork with sweet and sour sauce which comes with housemade dried pineapples and tomatoes and a sweet and sour sauce that will knock your Americanized Chinese food cravings out of your system. You might find yourself spooning an extra pineapple or two onto your plate when no one is touching the lazy susan, or asking for more rice to balance the sweetness. Sometimes the dried pineapples are available for sale to take home. 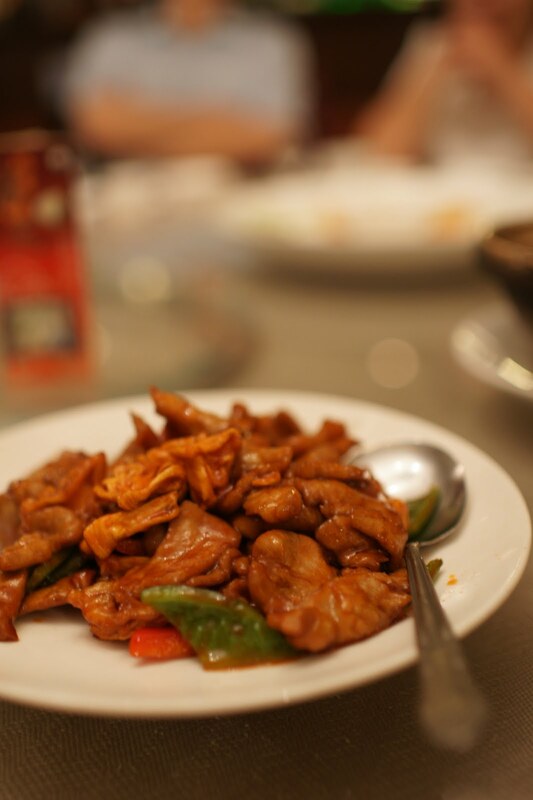 (2) The Yunnan style Roast Beef is tender and deceptively simple, with chunks of braised beef in the clay pot. But so delicious. (4) and the Thai style fried shrimp cakes. 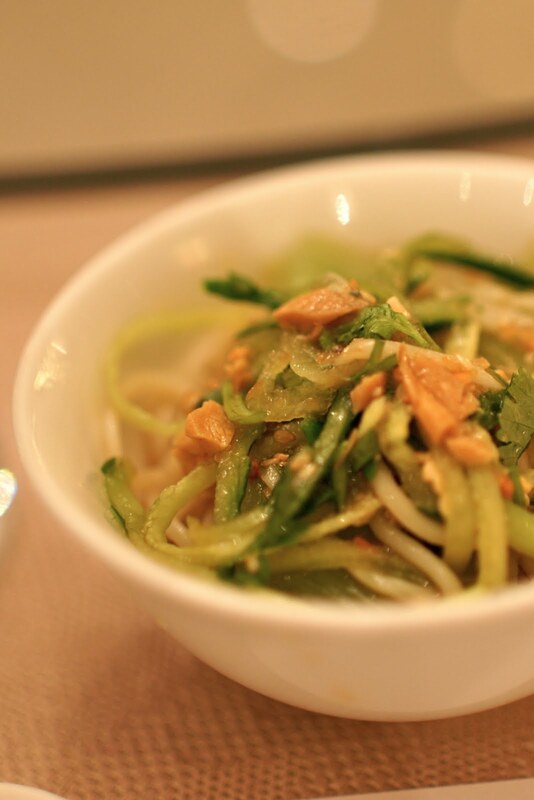 Yes, it's a Chinese restaurant, but it's a popular dish that's made well here. Everytime I've come, someone has ordered it. This is a huge portion because we had a lot of people that night. You can order more from the menu if you have more people. There is a ton of fish, pork, beef, seafood, chicken, vegetable, cold dishes, stewed pot and casserole options on the menu. I wasn't a fan of the house specialty Yunnan style pea jelly with sauce dish which features soft jelly noodles made from peas and is served as a cold appetizer. Every single time I've gone, the waiter has tried to encourage us to order this. Don't do it! Thought I would love the Yunnan style sesame and red bean layer buns, but the sesame was not sweet enough for me and the red bean had a date-like, orange taste. I know I'm not alone when it's time to figure out where to have dinner with a big group of people, be it all the relatives or a dinner with a group of friends. He Feng is perfect for big groups because it has two sections and one with large round tables with a lazy susans for family style dining and perfect when you need hearty Chinese food for the relatives. I think one of its biggest tables can seat up to 16-18 people. The menu is large enough that you'll find something to please everyone in your group, and varied enough to order different things each time. 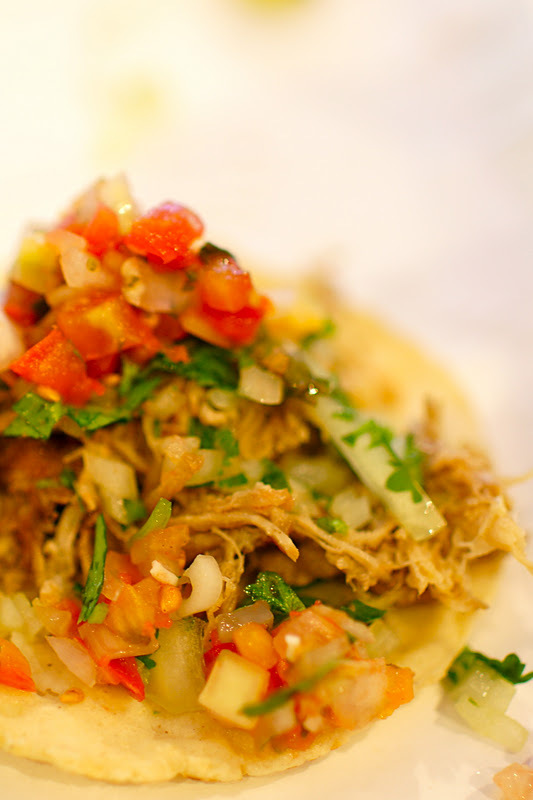 But you'll probably find that you want to reorder your favorite dishes again and again. kid friendliness: high chairs available. dining area on second floor, stairs only. Has it really been that long since I've last eaten at the Diner? I'd been scared off by the crowds and waits, and found other brunch and burger options around town. But the lure of the Diner in the Xinyi area was too convenient to resist. Even a few days after opening in late October, the newest branch of the Diner was already packed full of customers. Although it's in the ATT4Fun building, it has its own storefront entrance, across from Vieshow theaters. Don't go inside the main building looking for it, otherwise you'll make a huge circle around it. I was surprised by how huge the menu was, with more brunch (Frittatas, Baked Egg Rancheros, Baked Egg with Oxtail?!) and main dish items (Po Boy Sandwiches, Turkey Reuben, Pulled Pork sandwiches, Fish and Chips) than before, since I hadn't visited the Diner in such a long time. But it turns out this expanded menu is only for the ATT4Fun location. With the big windows, the space is airy and bright with more space than the other Diners, especially the basement located Dunhua Diner. I was a little overwhelmed by the new menu, and ended up ordering a Spinach salad (NT$310) which had bits of bacon, chopped hard boiled egg and blue cheese crumbles. The vinagrette was light and slightly sweet and I quickly polished off the sizeable salad. Other salads available are caesar, cobb, nicoise and grilled steak. as did my other friend's All American breakfast plate (NT$280), though the hash browns could have been more crispy. Save room for dessert- the Diner has slices of pie, scoops of ice cream, carrot cake slices, as well as their massive chocolate brownie with ice cream. The bill is paid downstairs at the register after the meal. I got the chance to try the pancakes I was craving on a return visit. On a weekday morning, it was nice and cozy, not too crowded with our food coming out fairly quickly. I probably gasped when I saw the banana and chocolate pancakes breakfast (NT$330) piled with whip cream and chocolate. The pancakes were fluffy and not too dense, and dotted with chocolate chips too, but I definitely couldn't finish the stack by myself. The bacon was crispy and the potatoes o'brien were well seasoned and good. You can get the pancakes or french toast with or without the eggs/breakfast meat/potatoes too. Hey! I just realized when writing this up that they left off my mushrooms. Oh well. It's great to finally have a brunch place in the Xinyi area, though it's kind of insane how far in advance you have to make weekend reservations.